Brexit Secretary David Davis will have the perfect excuse when Brexit destroys the United Kingdom. He admits he hasn’t done any in-depth research on the impact of Brexit. He doesn’t believe in it. He just believes in Brexit; it’s a faith for him. Who needs facts when you’re a self-described “determined optimist”? Mrs May knew then, as she knows today, that the UK cannot get a better deal with the EU than the one we have now. She knows, and so that makes her far more culpable than David Davis, who knows very little, and cares even less. What’s more, Theresa May is in charge. She could put a stop to this farce at any time. Or, if she really had principles, she could resign. The EU is the world’s largest free trade area. 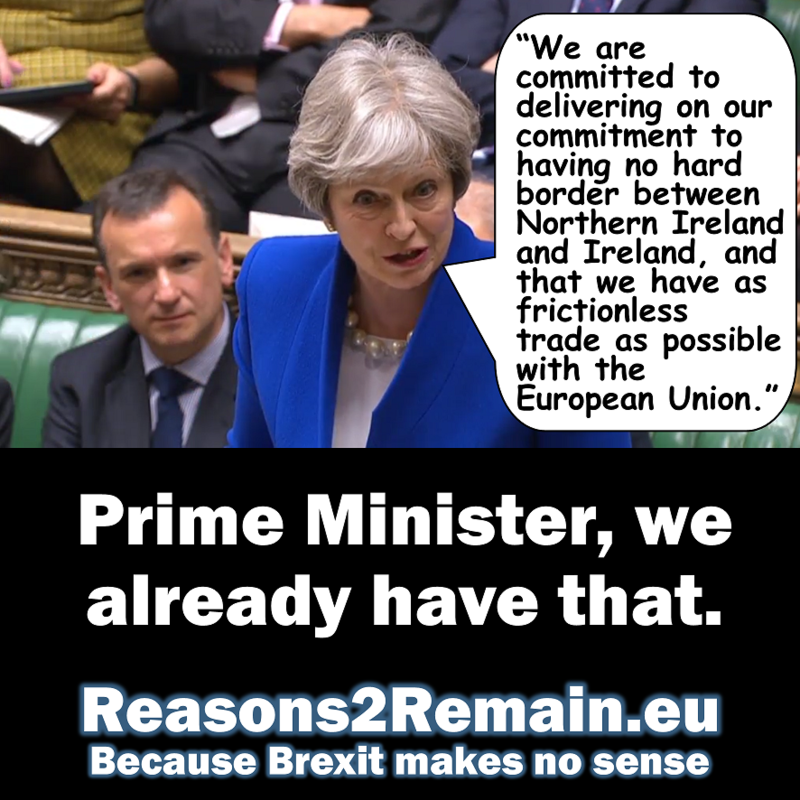 Prime Minister Theresa is desperate to continue to enjoy similar membership benefits of frictionless trade with the EU after we have ended our membership, because she knows, more than David Davis, that our economy’s survival depends on it. She has said she wants Britain to continue to enjoy membership benefits as an ex-member, without being part of the EU Single Market or customs union, without agreeing to the rules of the EU and its market, without being subject to the European Court of Justice to oversee those rules, and without paying anything to the EU for access. She says she aims to achieve this with a new trade agreement with the EU that’s unique to us, that no other country in the world has ever achieved. It’s never, ever going to happen. And Mrs May knows this. 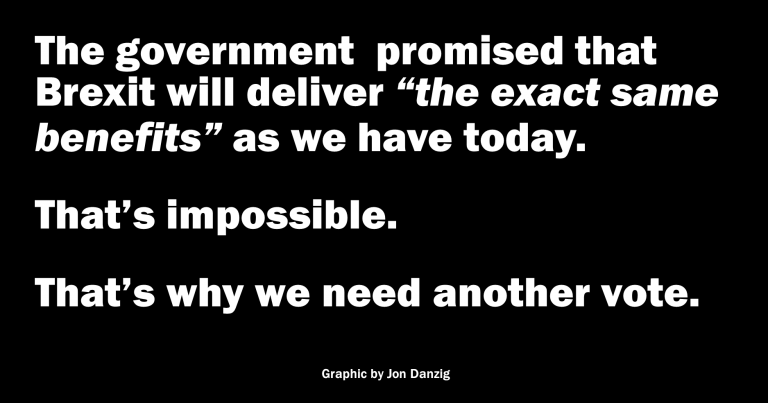 And this weekend, EU officials have echoed a similar home truth. 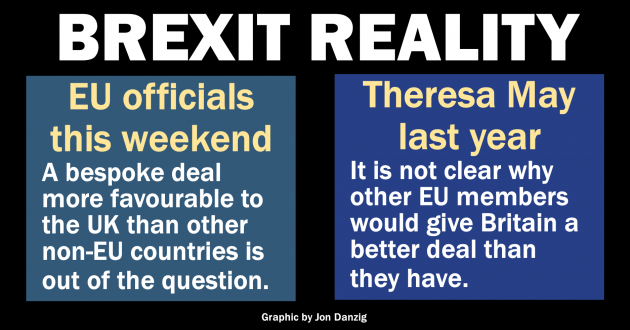 They have insisted that a bespoke deal more favourable to the UK than other non-EU nations was out of the question. If the EU allowed the UK to have a better deal than members and non-members enjoy, it would effectively mean the end of the EU. Already, non-EU countries are complaining that the UK should not have a better deal with the EU than they have. 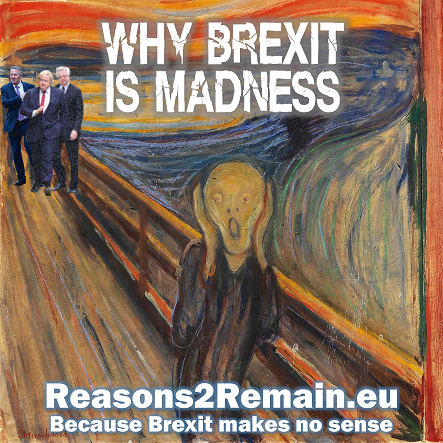 The official added that once the UK is out of the Single Market and customs union in March 2019, there could be no replication of the terms of the current trading relationship, or anything close to it, and no special treatment. “It is not just an indication of some strange rigid principle. It is because things won’t work,” he said. “First and foremost we need to stick to this balance of rights and obligations, otherwise we will be undermining our own customs union and single market. Second, we cannot upset relations with other third countries,” the official said. 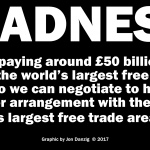 The UK is heading for a sheer cliff edge, that will cause us all enormous damage, from which it may take decades to recover. David Davis isn’t fully aware of this. He simply doesn’t know, and doesn’t want to know. He’s walking us over the cliff with his eyes wide shut. The ‘determined optimist’ just thinks we’ll all be able to walk on air. But Theresa May, she knows. She is fully aware of the dangers ahead. She knows there is not a hope in hell of the UK getting anywhere near as good a deal with the EU as we have now. She knows that leaving the EU is going to cause her country, our country, incalculable pain. Yet, she is still taking us over the cliff. May is acting with malice aforethought. Davis is acting without any thought. If you love our country, it is incumbent upon you to speak up. There is only one group of people who can bring the nation to its senses, and urgently apply emergency brakes to the terrifying Brexit juggernaut now hurtling at speed towards the sheer cliff edge. It’s our Members of Parliament. They are the ones who are supposed to represent us. They are the ones who are supposed to act in the best interests of the country. This coming week the Commons will vote on an amendment to give MPs a “truly meaningful vote” on Brexit. The “meaningful vote” amendment is the brainchild of former attorney general, Dominic Grieve, and calls for MPs to have a binding vote on the final Brexit deal before ministers can go ahead with Britain’s departure from the EU. Senior figures from across the Commons told the Observer last night that MPs considering whether or not to support the amendment should “put the national interest, not party politics, first”. For the love of Britain, please write to your MP today urging him or her to back this amendment (known as Amendment 7 of the European Union (Withdrawal) Bill). Only those against Parliamentary sovereignty would not want our MPs to have a “truly meaningful’ say on our country’s future. 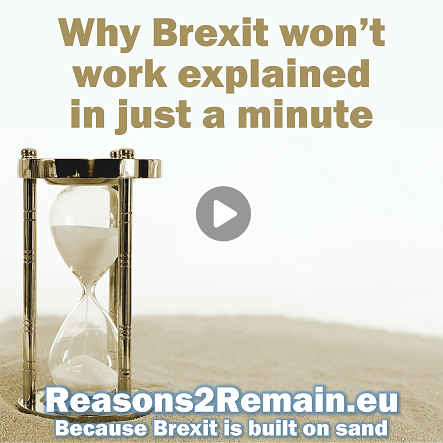 This entry was posted in Current Affairs, Democracy & Citizenship, Economics & Trade, Politics & Public Policy, Security & Defence, The EU, Uncategorized and tagged brexit, David Davis, European Union, Theresa May. Bookmark the permalink.